The iPhone is not the best smartphone around when it comes to battery life retention, and from time to time we’ve heard occasional reports that users are experiencing subpar battery life those in ownership of an iPhone 5. And today, the issue has been officially confirmed by Apple and the problem lies in the hardware of the device itself, and luckily you’re eligible for a free battery replacement, if you qualify for it. 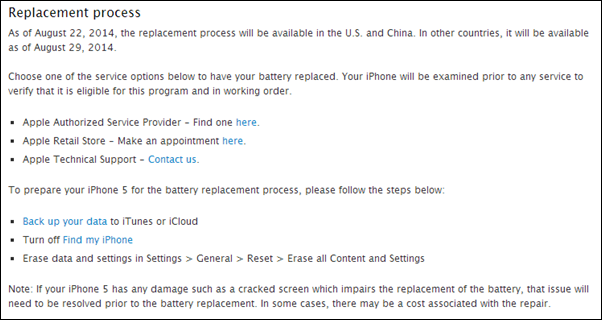 According to Apple on its support website, under the title ‘iPhone 5 Battery Replacement Program’, those users who are experiencing poor battery life can get their device’s battery replaced free of charge. 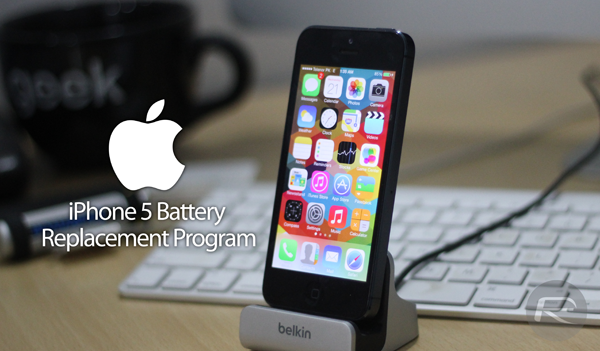 But the battery swap is not applicable to everyone, though; only those iPhone 5 units are affected which were “sold between September 2012 and January 2013”, according to Apple. And if you did indeed buy your iPhone 5 during that time period then you can consider yourself lucky, or unlucky, depending on how you look at the matter. Keep one thing in mind, Apple will not replace the whole device, because under this program, affected devices will only get a battery replacement, no more, no less, and that too free of cost. The battery replacement program is live in the United States and China as we speak, and if you’re residing in any other country, then you might want to hold yourself back till 29th August, which is just under a week away from now. Apple also highlights that if you’re going ahead with the battery replacement, then you should backup your data to iTunes or iCloud, turn off Find my iPhone and perform a full factory data reset. Simply head over to this link, after which you’ll be be asked to select your country and enter your device’s serial number in the box as highlighted in the screenshot below. Apple has outlined the whole battery replacement process on its support page in great detail, and getting around it is fairly easy, and we’re certain that affected iPhone 5 users won’t have any issues going about it. My wife’s phone is affected. Thank goodness as her battery life is terrible. You’ve no phone so stop complaining!!! Just spent 100 bucks to replace mine last week!!! Damn Apple. What do you mean by No phone, i sold my iPhone 5 before this scheme. I own 5S now and i am not complaining here about anything. I just said, i was victim of this bettery fault. $100?? A replacement battery is simple to do yourself and is less than $10! My wife followed their directions, spoke on phone with Apple representative, made appointment at Apple store, arrived at Apple store early for appointment, and was told they had no batteries. Put on list to be “notified” so she could make another appointment in the future and to be prepared to allow from 45 minutes to four hours for replacement. What about if we replaced the battery already…will we get a credit of some sort? I replaced mine a month ago…got my five in January of 2013.